Recently I was asked by my friend Lynn who lives in the UK if I wanted to join in this BLOG HOP with a DIFFERENCE I thought it sounded like a lotta fun so I said yes please ! CLICK HERE to go to Lynns blog Lynn is on the design team for Scrapology My list of friends with links are at the bottom of this post They will be posting next week 23rd June. 1. What am I working on right now . Right now I am completing some more pages for my art journal . 2. How long does it take to create a project . Mmmm that depends on what I am creating. or it can come together in 4 or 5 hours . I adore layering , and texture. I always reach for my inks, gesso and texture paste with my masks . I always choose my photo first . Subtle shadows, light and color are all ingredients for casting the spell..
some of My ART journal pages . 5. How do I become inspired and stay inspired . without doubt NATURE inspires me . connecting with the beauty that surrounds me. which I love to weave into my works. There are so many exquisite colors, shapes , shadows , in nature. definately stitching, layering and chippies are on everything I create . One of my Grungy Books AND a Box created with Graphic45 papers . One of my really crazy Grungy books about my garden . embracing stunning works of art .I love breathing in her words and allowing them to flow through my soul. and brilliant Grungy masculine cards with the midus touch . all stunning works of art . 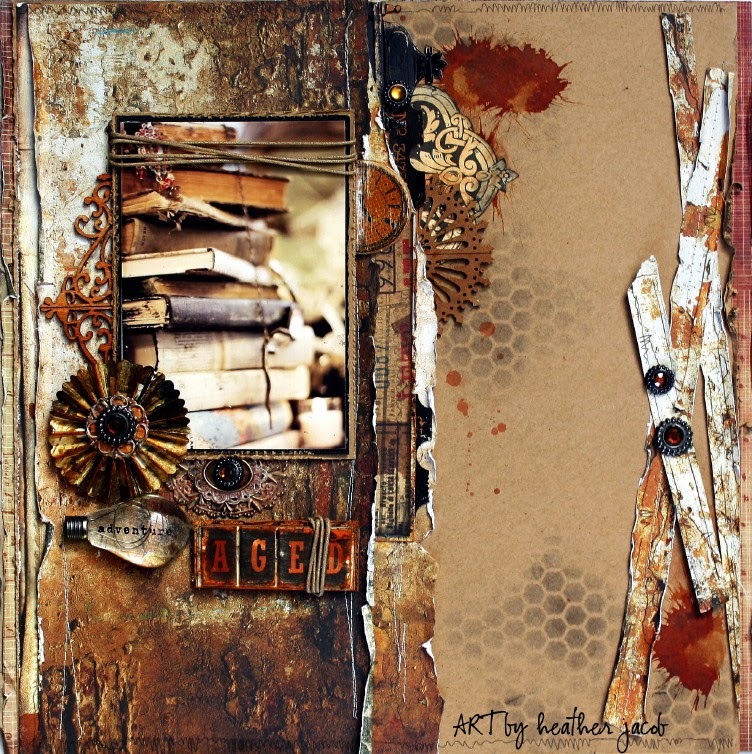 Paula has a beautiful arty style with lots of gesso, paint and striking color combos. with lots of texture and distressing on glorious background work. so many wonderful, interesting and velvety layers woven into her work . detail and creativity in each project she creates. Val's work oozes with personality, layering and texture. reflect such beauty, love and brillance to everything she creates . Glorious, fun pieces of art woven with love . Loved reading more about your creative process!!!! Love this...love hearing more about you. I always want to know more about the person behind the art. 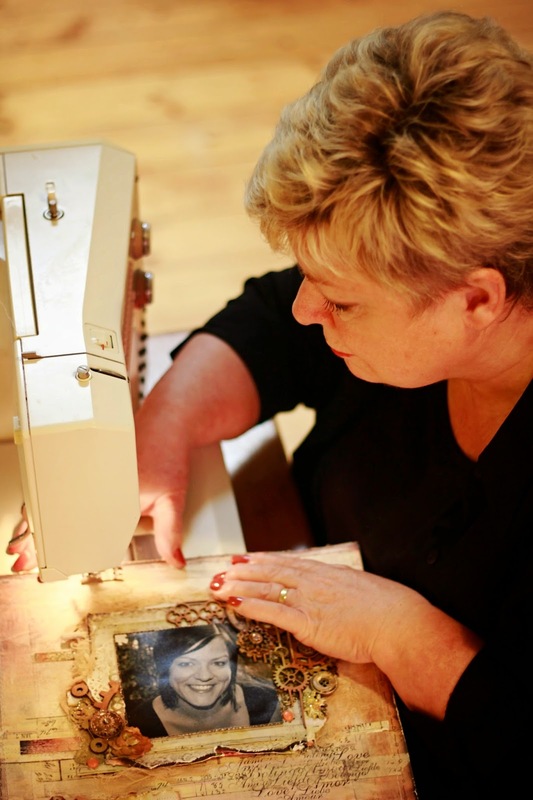 Love the glimpse into your world of scrapping! Your work is simply amazing! Thanks for giving us so rich sources of inspiration! Your work is totally amazing Heather. Loved reading a little more about you and reading those words you wrote about your friends really sums up the kind person you are. Keep on creating, you are an amazing inspiration to all. Your work always just blows me away Heather and so it is lovely to learn a little more about you and how you create your pages and art. I join everyone else in saying what a great inspiration you are - my dream would be to sit with you and watch you create! loved reading all about you and great photos! So lovely to revisit some of these magnificent layouts and pages.. always love your work and crikey you even look glamorous when you scrap going by that photo!! Your beautiful heart is always put on your creations in some way.. and these ladies you have mentioned are very special too!! I really enjoyed reading more about your process. Your work is always sublime - the photographs, texture, composition and colours always work so harmoniously together, it's always a visual delight. Thank you for sharing and for your inspiration. Oh Heather this is such an inspiring and wonderful post! It was wonderful to get a little more insight into your creative process! No matter what you put your hands to, the results are always incredible, I LOVE YOUR WORK!!!! You are just one amazingly beautiful SOUL!!!! I agree with Helen...such a high standard that you put up for us...Thank you so much for your kind and inspiring words dear friend, and thank you for taking me along on this Blog Hop with you!!! Big Bear Hugs!!! Loved this getting to know you post. You are a wonderful soul!!! So Beautifully done,loved reading more about you,& viewing all of your STUNNING projects!! !